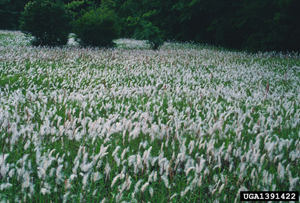 Impact: Cogongrass has been ranked as one of the ten worst weeds of the world. It can invade and overtake disturbed ecosystems, forming a dense mat that makes it nearly impossible for other plants to coexist. Large infestations can alter the normal fire regime of a fire-driven ecosystem by causing more frequent and intense fires that injure or destroy native plants. If you have spotted Imperata cylindrica (Cogongrass), use this report form to send an email to the appropriate authorities. Did You Collect a Specimen? If applicable, what is the host plant? Comments: Describe the species, impact, infestation or generally what you are seeing. Please upload a photo of the specimen or the site where the specimen was seen. NOTE: The photo file must be no larger than 2 MB in size.